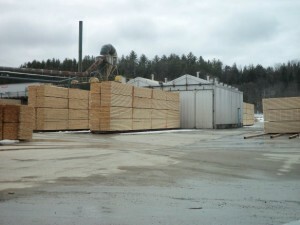 Located in Milan, New Hampshire, Milan Lumber Company provides lumber to wholesalers like Hancock Lumber and Hammond Lumber as well as to crate and pallet makers. “We also sell to private labels like Gerbing, which sells to Home Depot,” said Steve Halle, the mill manager. Milan Lumber uses the Wagner MC4000 In-Kiln Moisture Measurement System, which offers a real-time view of the moisture content for each kiln sensing zone, and provides a moisture content trend graph of all of the sensors during the drying schedule. When the average moisture content of a kiln’s Sending Units’ (moisture sensing zones) measurements reaches the set-point, a relay output activation will occur that can trigger an alert notification signal to annunciator panels or a shutdown command to kiln control system hardware. How about you? Are you ready to start saving money with Wagner Meters’ line of quality products? Give us a call at 800-634-9961.